Logs are often seen as just things to throw on a fire , at homemadehomeideas.com we feel there is so much more we can make, create and do with logs. From making clocks, paths and chairs to crafting coasters, lights and planters, there really is a DIY for every log no matter what size and every keen crafter no matter what experience. The list below is just a collection of the hundreds of tutorials and ideas out there. We hope they inspire you to go searching in the back yard, woods or parks to find those great versatile logs. Giant Wooden Trivet – This brilliant trivet would add style to any kitchen or dining table. Log Book Ends – These book ends are simple to make and make a real natural earthy statement to your book shelf. Log Slice Chalkboard Ornaments – This cute garland allows you to decorate the circles in any way you want may that be a ‘happy birthday’ lettering or Christmas drawings. 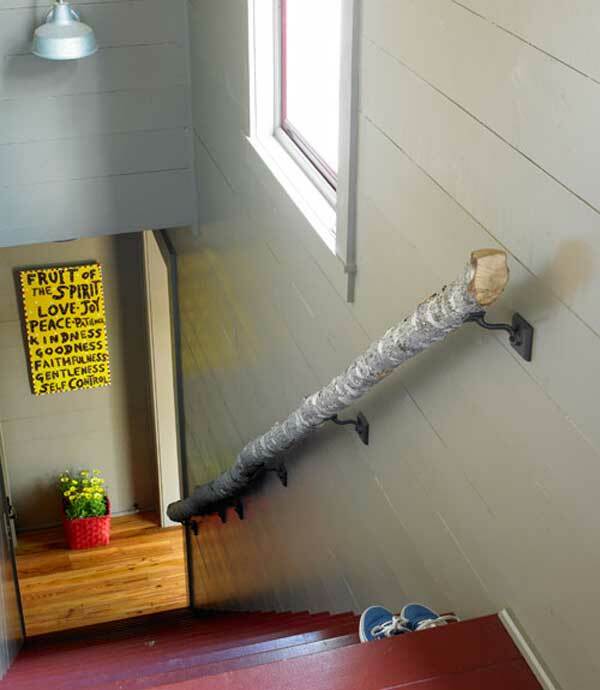 Log Handrail – So this DIY may be slightly extreme but looks simple and effortless connecting inside with outside. Log Lounge Chair – A lounge chair made from logs? Yes this is a great weekend project to get your teeth stuck into. Ombre Log Table – Add a colourful inexpensive table to your patio and brighten up the garden no matter what size. Log Planters – A long lasting log planter could be filled with naturally log friendly plants like ferns and ivies. Log Chalkboard – Get looking in the log pile for a perfect sized log, add some chalkboard paint and voilà. Log Fairy Lights – Wrap any lights around a rustic log and you create a great lighting for inside or out. Garden Path Made From Logs – This tutorial is simple to make and helps identify various garden areas in a stylish way. Log Clock – You can turn almost anything into a clock, and this DIY turns a log into one – a great wall feature. Rustic Pencil Holder – This pencil holder is a cheap and fun way to store your pencils whilst brightening your room at the same time. Woody Mirror – With lots of log slices and an old or new mirror, you too can make a really pretty mirror. Panton Log Chair – With the right log, tools and vision you can create a copy cat chair inspired by Verner Panton. Simply follow this video tutorial. Rustic Table Centerpiece – This great video tutorial shows you how to make a wonderful centrepiece whether that be for a wedding, a formal occasion or even Christmas. Faux Stacked Logs Fireplace – Stacked logs are so fashionable right now. If you want the look but not the actual logs and fuss then this is the DIY for you. Log Candle Holder – It is very likely you have these materials lying around the house, if so…then this DIY is completely free! One Log Rocket Stove – With a few basic skills you could make this outside stove cheaply and quickly. Outside cooking is the best! Rustic Log Cake Stand – This beautiful cake stand would be perfect for an outdoor wedding, combing style and nature to make a real feature. Easy Log Coasters – An inexpensive DIY, these could make great gifts, why not get the kids involved to paint some funky patterns and designs.